Share the post "Best Day Trading Books to Build Solid Trading Strategies"
In 2017, traders have been more and more focused on day trading books to help them trade today’s volatile markets. With Trump in power, North Korea testing missiles and terrorist attacks more frequent, day traders see plenty of volatility to run their day trading systems. Also, there has been lots of talk about how High-Frequency Trading algorithms have changed the nature of the market. As a result, many day traders have had to adjust their strategies to account for today’s frequent traders. As they say, if you are not updating your skills, mindset and strategies to tackle the ever-changing conditions, then you will get left behind. Nothing is truer than with day trading, and this is why we have listed the best day trading books available. Both of these incredibly successful day traders have carved their niche out of excelling in the day trading field. In fact, both of these day traders were featured in Jack Schwager’s Market Wizards books titled ‘Interviews with Top Traders’ due to their successful trading history. Another all-time classic that every aspiring day trader should read is Pit Bull: Lessons from Wall Street’s Champion Day Trader. Pit Bull is written by Marty Schwartz and released in 1999. One of the things to remember about day trading books from the 1990’s is they are more of a narrative of their processes and daily action. So if you are looking for a day trading strategy book, then Pit Bull is not going to be at the top of your day trading book list. But if you are looking for an action-packed story, which is at times fun, entertaining and downright nerve-wracking, then Pit Bull would fit the bill perfectly. Both Marty Schwartz and Mark Cook made incredible gains in the World Trading Championships, and Mark D Cook managed to win two titles. One of the top rated day trading books to come out in the last few years is ‘How to Day Trade for a Living: A Beginner’s Guide to Trading Tools and Tactics, Money Management, Discipline and Trading Psychology’ by Andrew Aziz. You can view the 300+ reviews on Amazon here. Andrew Aziz’s background is engineering, so he has a mechanical trading system mindset. This means he has a preference for creating trading systems which have a systematic edge and then he looks to apply that edge every time the system generates a new signal. Most importantly, ‘How to Day Trade for a Living’ is straight to the point and filled with insights and practical trading ideas. As a day trader, you will find one of the most powerful things you can get access to is day trading ideas. Because you already have your day trading strategies now, sometimes it is just a matter of tweaking existing ones or adding a few new ones to the mix. For many, Aziz’s book comes highly recommended as their best book on day trading. But, as with all of the best books, ‘How to Day Trade for a Living’ isn’t one of those books you read once and let collect dust on the bookshelf. Instead, Aziz’s book is one you will get the most out of on the second and third reads as your day trading career evolves. Brett Steenbarger is one of the most prolific writers in the trading space. Not only that, but he is well and truly one of the most respected authors on the planet. Brett has one of the best philosophies for those who are starting out. He highly recommends you try some different approaches such as swing trading, day trading, technical analysis fundamental analysis, mechanical system trading and discretionary trading to name a few. But what he likes most is the ability for people to test nearly every style of trading system on an intraday basis. The reason the day trading timeframe is so great is the number of opportunities you get, allowing you to test your ideas in the market. Your testing may take on paper trading, or you may risk a relatively small capital base during your testing phase for live trades. So if you are trading a longer-term trading system, you may get 30 trades per year, and it will take you several years to build your confidence and expertise. However, if you were to apply the same rules and trading ideas to an intraday timeframe, you could get 30 trading opportunities in a month. This allows you to test and hone your day trading or even medium-term system at a much faster rate. Being able to test your ideas on a large sample size is one of the greatest reasons why every trader should add day trading to their repertoire. If you are looking for day trading tips and trading tips for beginners, then this is the soundest idea I’ve seen. One of the very first books I read on day trading was shortly after the hyped up tech boom in 1999/2000. Van Tharp, one of the world’s best trading coaches, wrote the book in 2001 and it followed a period when mum and dad investors were buying and selling their way to become day trading millionaire’s. Of course, at the time, they never realised it was as a result of the tech boom and the markets were about to go bust in a huge way. What caught my interest the most was a story he related about a day trader who had a systematic day trading strategy, and he would apply it every day. Day trading and golf – the perfect combination? On one of the day’s, he goes to play golf after his day trading morning session. In the book, Van Tharp relates the story of the day trader making around $11,000 for the morning session (obviously a vast portfolio) and then heading off to play golf for the rest of the day. Now as a keen golfer myself, this story resonated with me more than anything else. I could not imagine anything better than placing a few trades in the morning, banking an above average day trading tally and then heading out to the links with my golfing buddies. What a dream hey. When it comes to day trading, you can create your lifestyle, and you can choose how much it impacts your life. No matter if you trade penny stocks, currency trading, use a scalping strategy, use candlestick charts or only prefer to short the stock, day trading could be a way to increase your returns. 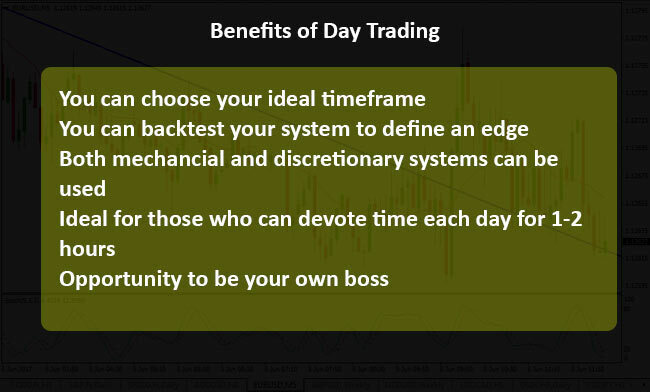 You can identify the ideal day trading timeframe to fit your lifestyle, and that is the main reason why day trading has such universal appeal. Living in Australia, you can day trade the London open including the FTSE and DAX index after your work day is finished. A lot of day traders trade the Forex market, focusing on the London session, leading into the US session. If you live in Australia and love to get up early, you can day trade the US close. This could include day trading US stocks or the Forex market. Plenty of volatility with both of them. Some of you may have a job which starts late each day. As a result, you may like to trade the US open whether it be day trading the S&P500 index, the US stocks or the Forex markets across the US fix. New Zealanders who like to get up early are perfectly positioned to day trade the close of the US markets. As you can see, the examples above are for those who are not living in the European or US time zone as they are the two biggest markets for day traders. So it makes sense to consider the alternatives for those living in markets which have low liquidity, such as Australia and New Zealand. 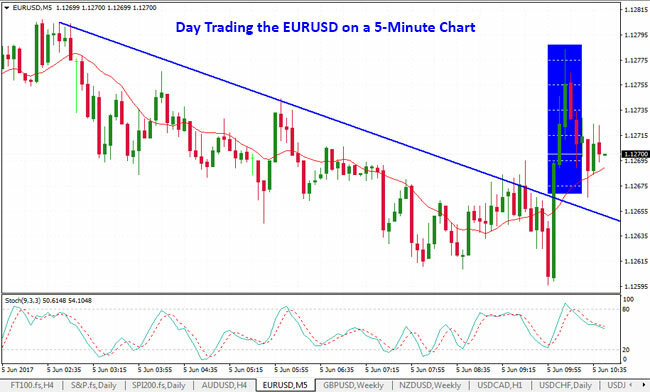 If your time frame is limited and you are day trading Forex you may want to trade breakouts and momentum trade. This means you look for breakouts where the momentum is carrying forward or going short and taking short positions. Below you can read a synopsis of the top 5 best day trading books you should read in 2017. If you have ever felt you had the skill to day trade and wanted a robust set of ideas, strategies and mindsets to get you started, then this is the book for you. Aziz has laid out a simple to follow day trading guide, filled with exciting stories, robust day trading strategies and sets a realistic expectation of what is possible. His day trading book has plenty of rich and colourful examples including charts on technical analysis, day trading setups and the anatomy of a day trade. This book is perfect for anyone with interest in day trading stocks, indices, commodities or Forex markets. If you are feeling confused by the plethora of day trading strategies available to you, then perhaps you need to simplify things. Markus has written an excellent day trading book, which is short and straight to the point. Instead of inundating you with dozens of strategies, he has pinpointed a particular strategy you can start testing straight away. You will be pleased to know Markus focuses on the technical setups of his strategy, which involves Bollinger bands, MACD and the RSI. The full day trading strategy is revealed including your entry, exit and most importantly, how to take profits on successful trades. If you are looking for one of the best books for day trading, which allows you to understand the full day trading strategy quickly, then this is the book for you. Not only that but after you have read through it, you can open up a demo Forex account and start testing it on a live demo trading account. This is the beauty of the fast paced internet world we live in. You will see exactly what the strategy is in full detail with nothing left to the imagination. Brian understands the importance of timing the market when it comes to day trading and his combination of strategy and timing are what makes his approach stand above the others. If you like the idea of learning a strategy then implementing and then mastering it, grab this book as it is ideal for those looking for mastery and not just another shiny object. The reason Emilio Tomasini’s book made it into the top 5 best day trading books is because the mindset of creating and building a mechanical trading system is super important. You are not going to learn specific day trading rules and strategies here, but you will have the mindset of what it takes to build a day trading strategy with an edge. You will learn how to create and test your day trading systems, allowing you to build confidence and execute your systems at time frames suitable to you. One of the often overlooked strategies most day trading books avoid is risk management. Tomasini outlines a solid foundation of risk management, which you can apply to your day trading systems. If you plan on being a day trader both now and still having a trading account into the future, then grab this book today. Harvey has been able to distill the most critical elements to short-term trading in one of the essential day trading books. Harvey gets your mindset on track regarding treating your day trading as a business. Walsh outlines the importance of understanding risk versus reward and how you can use that to your advantage when day trading stocks. You will learn some specific trade setups, allowing you to enter day trades with the confidence of thoroughly backtested ideas. One of the most common ways for people to day trade the markets is through using chart patterns. Walsh is big on these and highlights his best chart pattern setups for short term day traders. Add this day trading book to your library as it is modern and covers everything you need. Please note that if you click on and purchase a book via the links on this site, then we will earn a small commission.